Upload and share your PDF files related to Furnishings in this category. 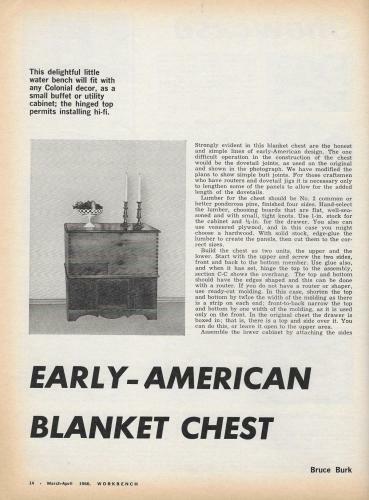 Some examples may be armoire, coffee table, chest, book case, bed, dresser. 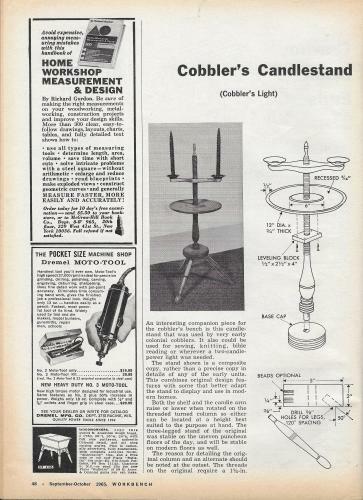 A personal note from me, I love this design, this is quintessential Early American true to it's design and practical use. 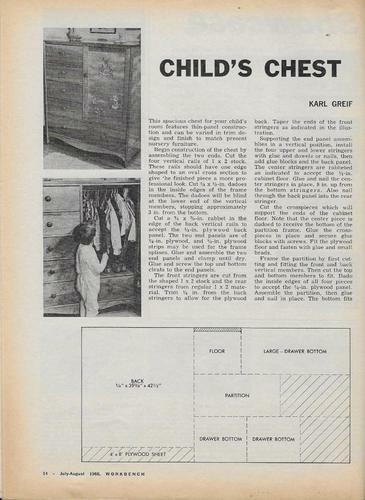 This chest will make a wonderful project, and and wonderful hand tool project as well! A great throwback for your bath area or any room. 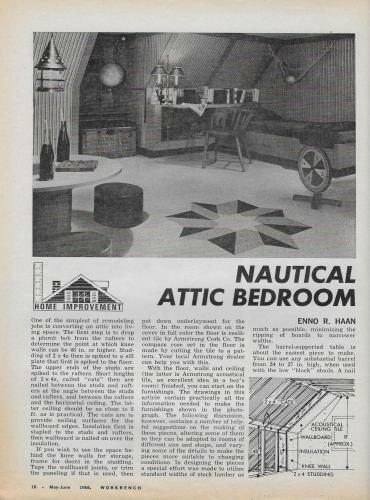 This old plan has a nice set of dimensions, leaving you the builder with plenty of room for artistic interpretation. Have fun! 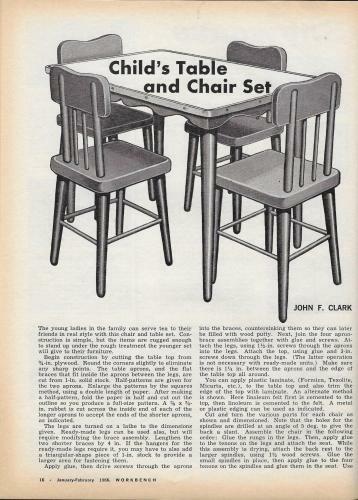 This is a classic design for the kids, back in the day this plan was marketed as a "for the girls serving tea" set, but our boys would love this for their use as well. A crafts table, model building, you name it, all the kids can benefit from this piece of furniture in their room. This is a wonderful download for everyone to use. I love this time period of furnishings, and I love the Danish style that has become once again very popular, as a matter of fact, Danish Modern is a timeless style, and it never gets old. 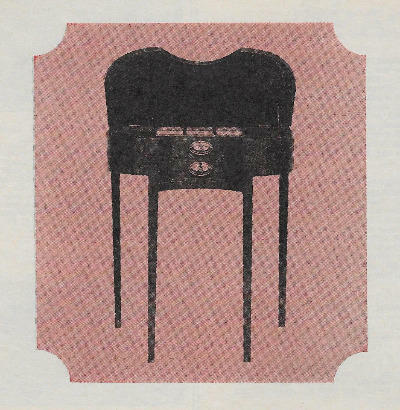 Someday, I would love to make this set of chairs, and I will, they are beautiful. Have fun! 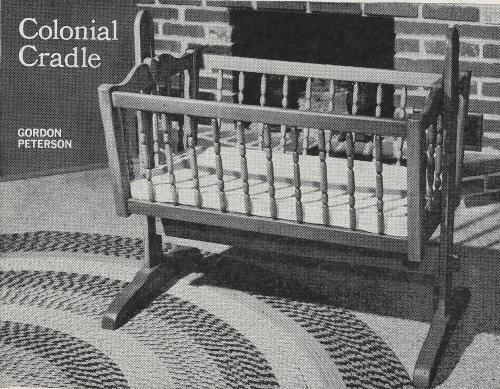 This is a wonderful project, from one of my favorite time periods, Colonial America. 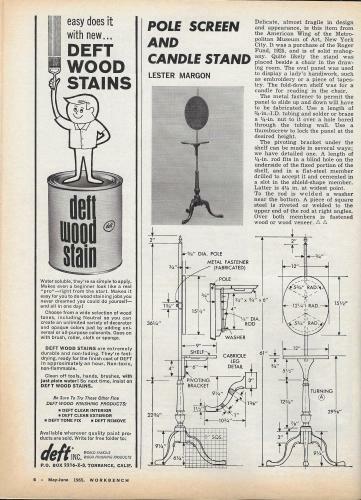 Just imagine making this project from maple, or better yet, curly maple and giving it a dark deep antique stain. 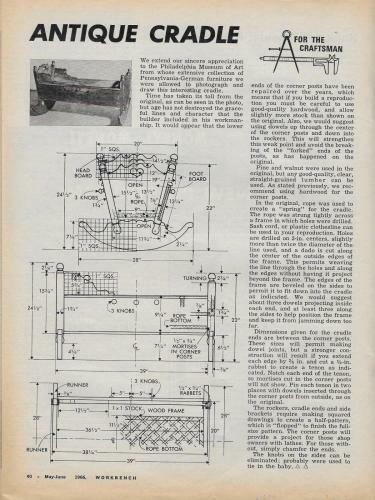 As is with all these Workbench Magazine plans, they are more of a schematic than they are plans, giving you dimensions and scaled grids for your own templates. 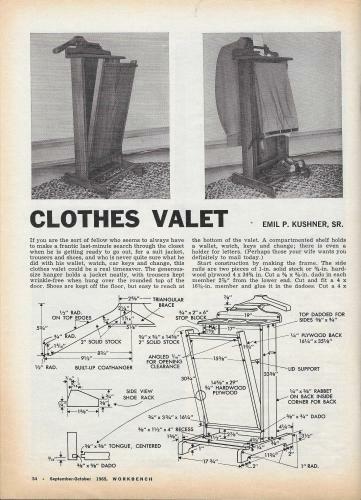 I love these modern era furnishings, the clothes valet, may be out dated, but if you are in a tight space, such as a studio apartment or small home, and lack sufficient closet space, this would be a great project that is both useful and fashionable, imagine this piece in Walnut! I love cobblers benches, dad made one many years ago for uncle, and it turned out to be the discussion of many a party and get together. 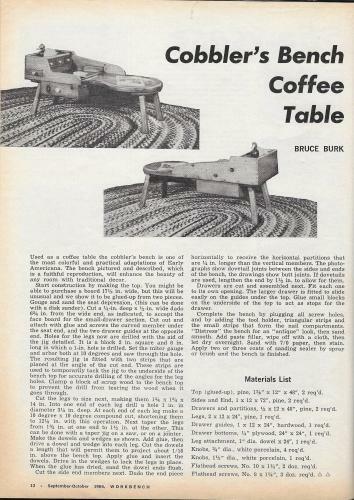 You can use the cobblers bench for a coffee table, end table, or even to work on in a real life working environment. 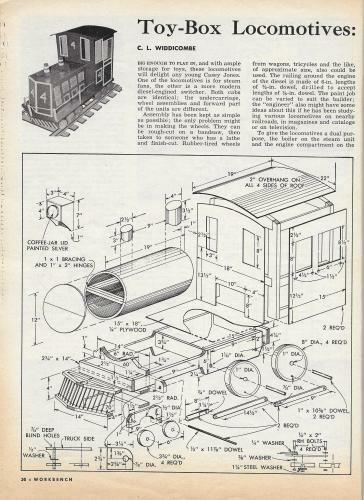 The schematics of this plan are good, they assume the builder already has a grasp on the fundamentals of woodworking. Have fun! 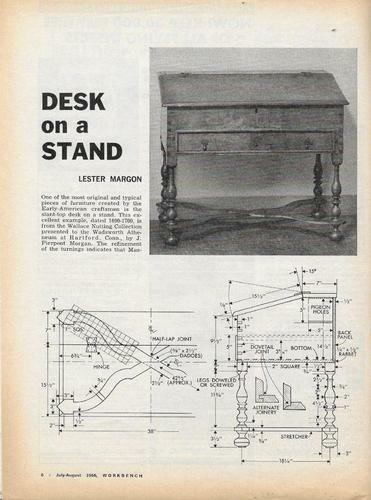 These old Workbench Magazine's were fairly light on the detail, but with some prior knowledge and experience you can use this plan as a great jumping off point to build this wonderful piece of furniture history. 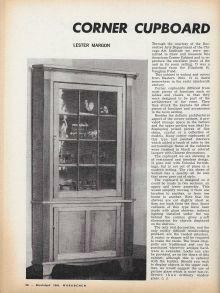 This scan is of a corner cupboard, this is a great example of traditional design. 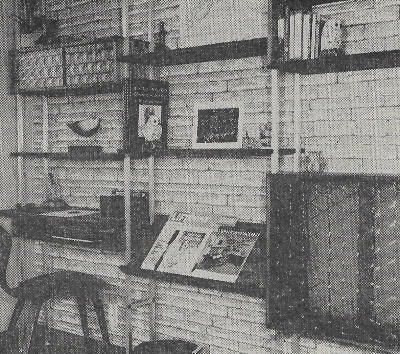 These old Workbench Magazine's were fairly light on the detail, but with some prior knowledge and experience you can use this plan as a great jumping off point to build this corner cupboard. 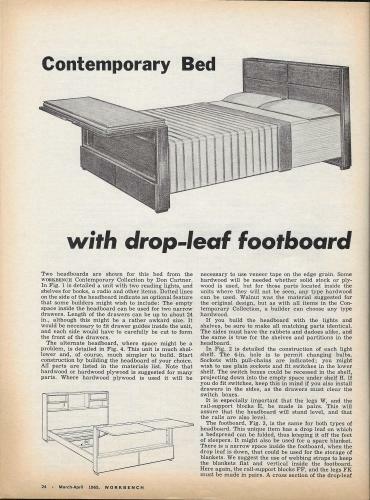 This scan is of a contemporary bed, I love these modern designs, the 50's and 60's highlighted much of the modernism furnishings that are popular today. 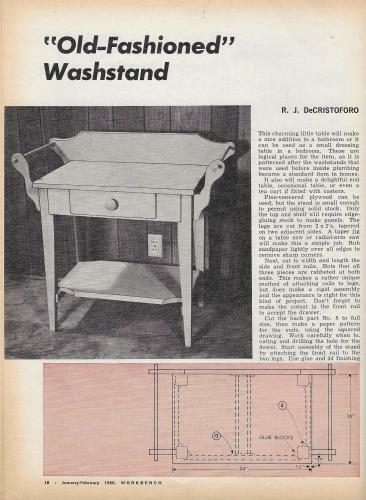 These old Workbench Magazine's were fairly light on the detail, but with some prior knowledge and experience you can use this plan as a great jumping off point to build this contemporary bed. 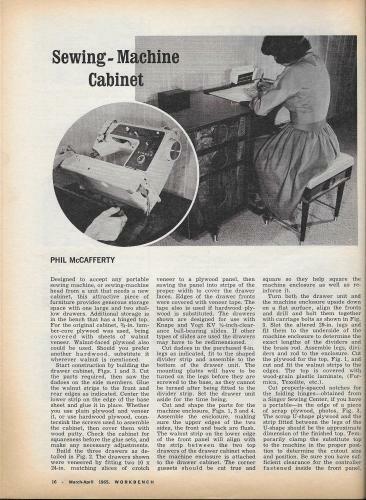 I bet most of us can remember the good ol sewing machine cabinet that mom or grandma used to own. They were well built, classic, and beautiful. Here is a great chance to get to know one inside out, and possibly even build your own. Have fun! The powder stand is a classic addition to your home, not too mention the project itself presents various aspects of skills that you can hone during the construction, from turning to carving, it's all there. Have fun! 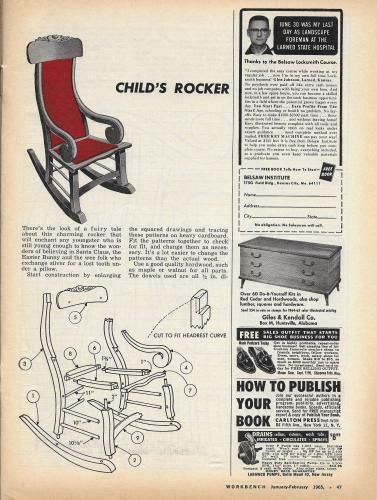 Have fun with this wonderful throwback child's rocker. 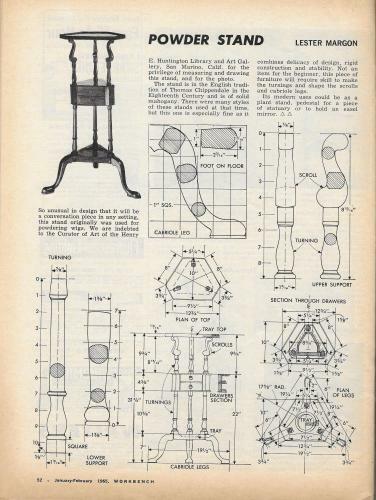 You'll have a some patterns for chair parts, all you need to do is scale them to fit your needs. Have fun! 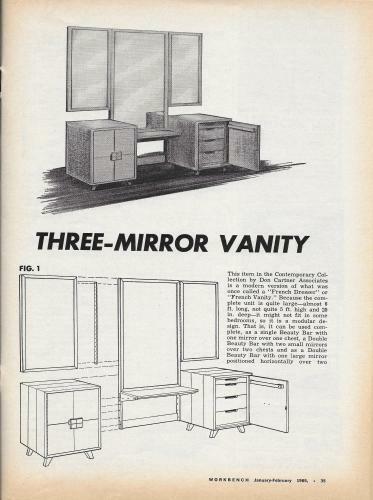 The Three Mirror Vanity is a really cool file/plan. 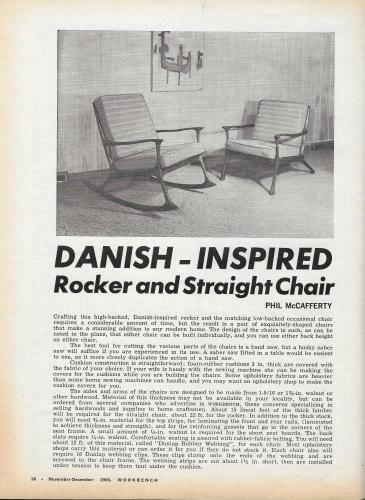 Today, the modern, contemporary, danish modern has made a big comeback. And this project fits right in with what is hip today. It's amazing how good design never dies. Have fun! Got kids! Even if you don't this Locomotive Toybox chest will bring out the kid in any woodworker. I thought this would be a fun one to publish here today, basic construction, and perhaps this will end up in a child's life by Christmas! Have fun! 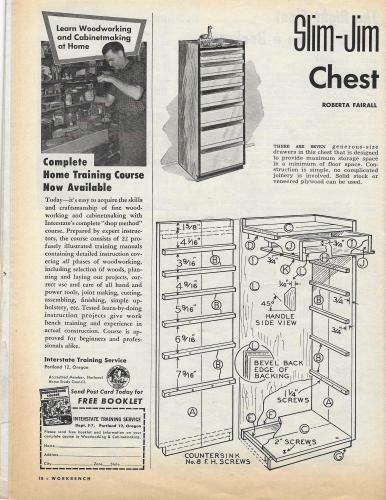 This is a really cool chest for your shop, it's basic, it has a nice cut list on the second page, and you can use this as a jumping off point for your chest or build it per plan, your choice! 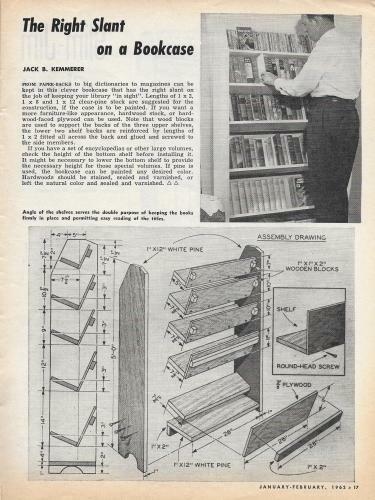 Enjoy this nice slant bookcase plan with good dimensions and great proportions. The detailing is pretty good for this plan set, good measurements and you can use your imagination to build it out of virtually any wood species. A simple style that still looks good today. You should think about adding some ornamental accents such as a dark wood species dowels for the sides in place of screws.